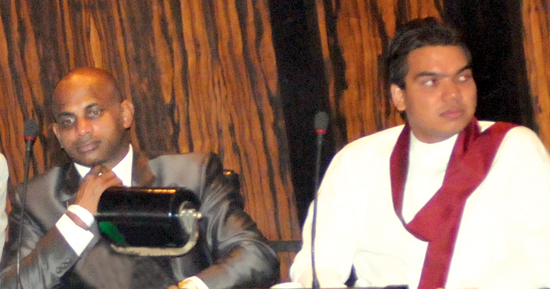 Young ‘uns in the forefront.... At left: Sri Lanka’s top cricketer Sanath Jayasuriya and up-and-coming rugby star also at national level-Namal Rajapaksa (on right) who made their way into Parliament at the recent elections. Picture by Saman Sri Wedage. Sanath Jayasuriya has a tendency to set up records both on the field as well as out of it. His a latest record is that he will become the first Member of Parliament to ‘don’ pads and bat in the forthcoming T20 World Cup to be played in the West Indies starting on April 30. OBSERVER - MOBITEL : Former Nalanda College captain Gihan Rupasinghe became the fourth Nalandian to win the prestigious Observer Schoolboy Cricketer of the Year Award in 2006. LONDON, April 25, 2010: Twenty20 may have spawned movie star-backed franchises and a frantic dash for cash, but the world championship is a reminder of how nation against nation contests remain central to cricket.